As a result of additional funding that has become available through an agreement between UMKC and KC Scholars, additional scholarships are available to 2018 Traditional Scholarship Applicants. 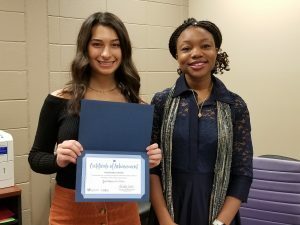 Because of her high scores during the original application process, Marianna Donze was awarded one of these scholarships. She was presented a certificate on Friday, November 9 from KC Scholars. Marianna is eligible to receive the scholarship providing she attends UMKC, which is one of Marianna’s choices. It is valued at $10,000 per year, renewable for a maximum of 5 years. Pictured Marianna Donze and KC Scholars representative. For more information on Kearney School District, visit www.ksdr1.net.